Members of a second-line marching band lead a crowd on an annual march across the University of Kansas campus in honor of Martin Luther King Jr., Tuesday, Jan. 22, 2019. 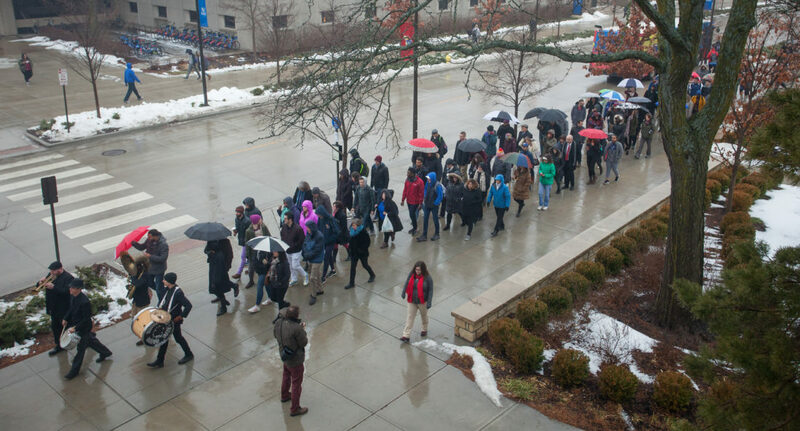 The marchers walked through a light rain from Strong Hall to the Kansas Union. Through a misty rain, members of a historic black fraternity and a second-line band led a large group of students and faculty in a march across the University of Kansas campus Tuesday in honor of the civil rights leader Martin Luther King Jr. Prior to the march — which started in Strong Hall in the center of Jayhawk Boulevard and traveled east to the university’s student union — Clarence Lang, interim dean for the College of Liberal Arts and Sciences, urged audience members to think about how they can work with others to make the world a better place. “On this campus, and more broadly when you think about where we are as a society, the importance of people coming together to discuss how to make our society more humane is certainly something that’s gone out of fashion, and we need that kind of activity more than ever perhaps,” said Lang, who is a scholar of African-American history. 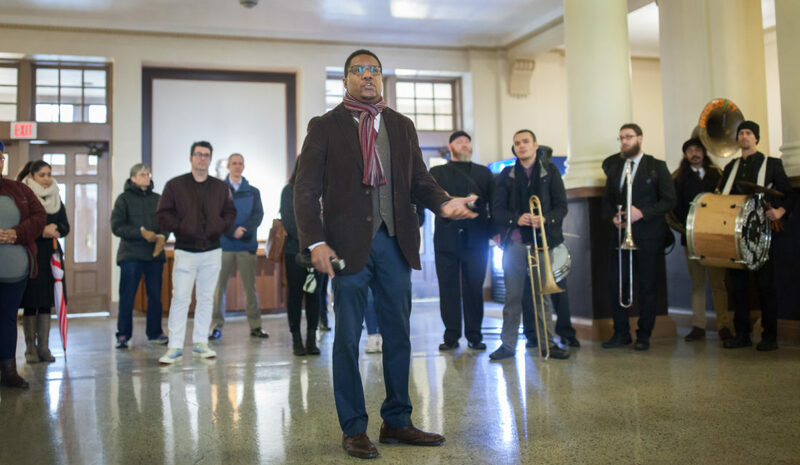 Clarence Lang, interim dean of the University of Kansas College of Liberal Arts and Sciences, speaks to a crowd Tuesday, Jan. 22, 2019, at KU’s Strong Hall before a march to the Kansas Union in honor of Martin Luther King Jr. Lang is also a professor and chair of KU’s Department of African and African-American Studies. Lendon Jackson, a sophomore from Frisco, Texas, said he was happy to help lead the march along with two other members of the KU chapter of Alpha Phi Alpha fraternity, the first African-American fraternity established in the country. “It’s a great experience and it’s rather humbling to represent and symbolize what Martin Luther King Jr. fought for,” he said, noting the importance of African-Americans filling leadership roles. He said he appreciated that Lang gave comments prior to the march because it showed that the university, from administration down, cares for the students and the diversity on campus. After the march, Carl Lejuez, KU interim provost and executive vice chancellor, told the marchers that the event is meant to honor King, but it also shows that the university has a responsibility to be proactive on issues of inequality and racism. Lejuez said he thinks the university has come a long way on those issues, but still has further to go. “Let’s use this as a springboard for an entire semester where we take these issues seriously and keep them at the forefront of our mind,” he said, referencing the start of spring classes Tuesday. “It was really nice to see people of all races and ethnicities participating in the march and acknowledging Dr. King’s legacy but also acknowledging the work we still have to do,” she said.